In a quick and somewhat hushed up special board meeting last Friday the Weatherford Independent School District Board of Trustees did one good thing by swearing in their newest board member Dr. Joshua Tarbay. However, they also granted Superintendent Dr. Jeffrey Hanks with the ability to finalize a land purchase deal in the amount of $1.25 million. 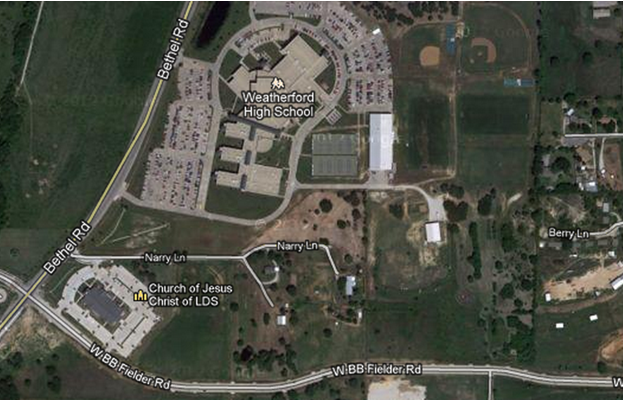 Weatherford isd contracted to purchase three tracts of real property, totaling approximately 15.197 acres, directly to the south of Weatherford High School for “district expansion”. Tract Three consists of improved property and more properly described as 5.347 acres (Hanna Gerald 302 Narry Lane) out of the Alfred T. Obenchain survey, having a street address of 302 Narry Lane, Weatherford, Texas 76087. The contracted sales price of Tract Three is $550,000.00. CAD value of Tract III including all improvements – $164,760 (FMV). WISD is paying more than double the fair market value (FMV). What happened to the so called “immediate need for funds”, when they are paying this outrageous price for land we do not presently need with “cash available”???? Apparently, the General Superintendent has never been told no before! I’m not against the district planning ahead for the future – but I bet this land is for more athletic fields and other embellishments. Yes, it is surprising they desperately needed $107 million – and now feel free to spend $$$ without hesitation since the bond was rejected. Huh??? Spend down cash on hand, then come begging to tax payers with another bond election. Priorities…. more land, or more security for the kids??? ?